I resumed my woodland walk, passing by a Hawthorn tree laden with red berries. 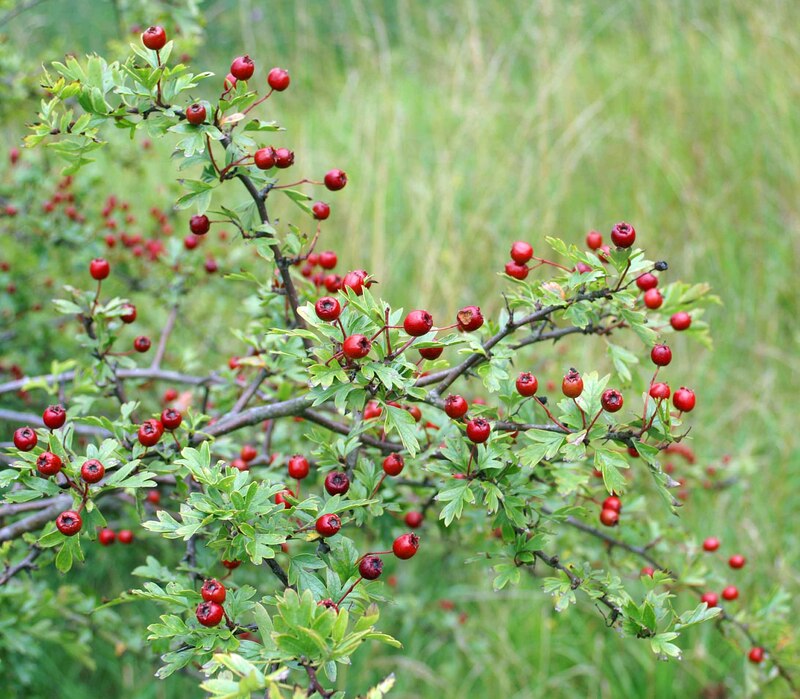 Crataegus commonly called hawthorn or thornapple, is a large genus of shrubs and trees in the rose family, Rosaceae, native to temperate regions of the Northern Hemisphere in Europe, Asia and North America. They are shrubs or small trees, mostly growing to 5–15 m tall, with small pome fruit and (usually) thorny branches. The thorns are small sharp-tipped branches that arise either from other branches or from the trunk, and are typically 1–3 cm long. The fruit, sometimes known as a “haw”, is berry-like, but structurally a pome containing from 1 to 5 pyrenes that resemble the “stones” of plums, peaches, etc. Hawthorns provide food and shelter for many species of birds and mammals, and the flowers are important for many nectar-feeding insects. Hawthorns are also used as food plants by the larvae of a large number of Lepidoptera species and haws are important for wildlife in winter, particularly thrushes and waxwings. I have noted several cotoneaster shrubs growing throughout this site, which I have assumed to have arrived there via bird droppings as the shrub is not generally a native of Britain, but is widely planted in gardens. * * There is an indiginous native cotoneaster that is found growing only on the Great Orme: Cotoneaster cambricus (Wild Cotoneaster; Welsh: Creigafal y Gogarth “rock apple of Gogath”) is a species of Cotoneaster endemic to the Great Orme peninsula in north Wales. 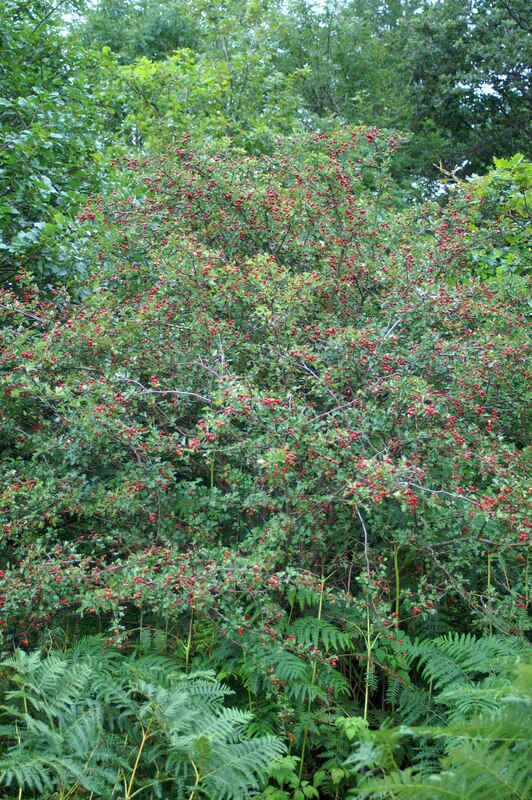 It is the only species of Cotoneaster native to the British Isles. It has never been found naturally at any other location. 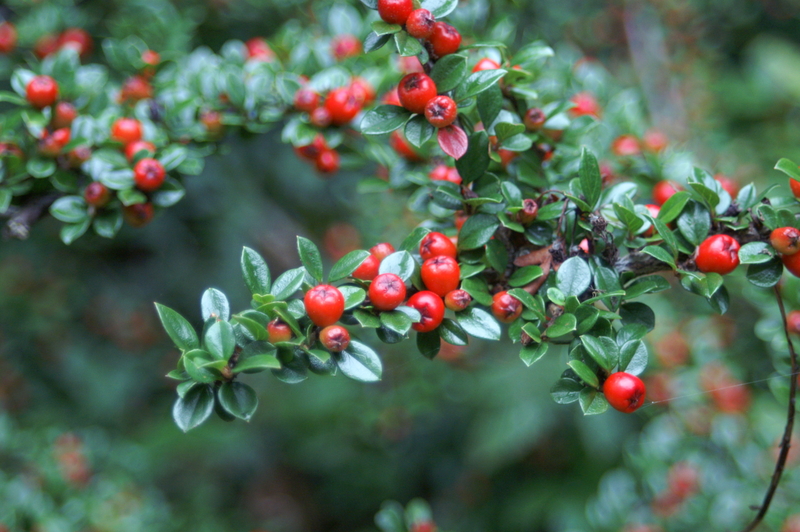 Cotoneasters provide an important reminder that even with the best intentions of gardeners, the wind, birds and other animals can help plants to ‘escape over the garden wall’. These popular garden and landscaping shrubs are also popular with birds who enjoy the berries and spread the seed. This can spread cotoneasters in the wild, where they can be difficult to eradicate. 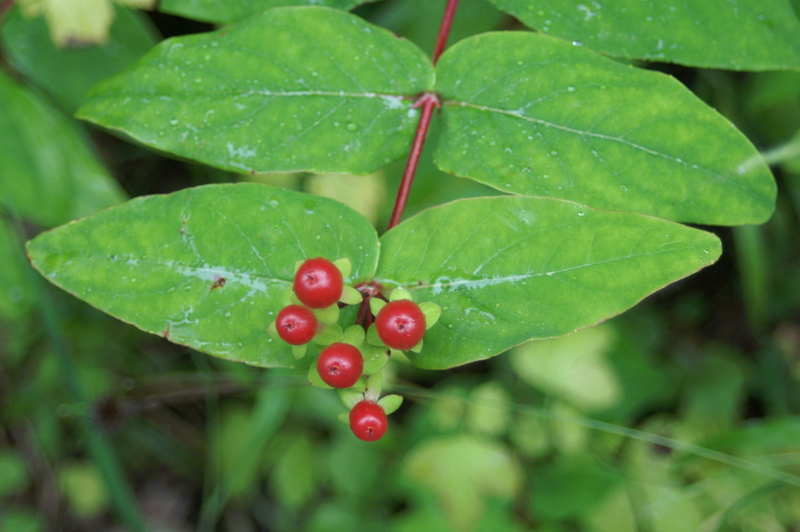 Another probable garden escape is Hypericum – St. John’s Wort, also growing in various spots throughout the site and also now bearing red berries. 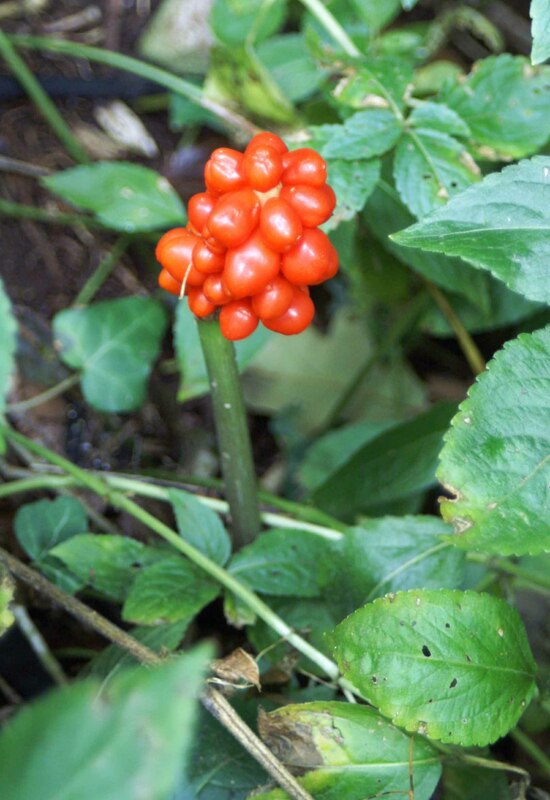 A native plant, the Arum lily or as I know it, Cuckoo Pint or Lords and Ladies, is also bearing bright scarlet berries now. I found them in a few places, mostly tucked almost out of sight beneath other shrubbery. Arum maculatum is a common woodland plant species of the Araceae family. It is widespread across temperate northern Europe and is known by an abundance of common names including Wild arum, Lords and Ladies, Devils and Angels,Cows and Bulls, Cuckoo-Pint, Adam and Eve, Bobbins, Naked Boys, Starch-Root and Wake Robin.